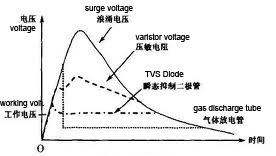 ﻿ Surge voltage originated - Technical Support - Fatech Electronic CO., LTD.
A surge is a burst of energy that exceeds the voltage and amperage capacity of downstream equipment, causing equipment damage if not suppressed. 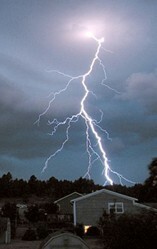 The most observable, destructive cause of surge damage is lightning. Through magnetic induction, even non-direct lightning strikes in the vicinity of exposed overhead electrical lines can produce 20kV surges. Surprisingly, however, lightning is not the most common cause of power disturbances. In many areas, 80% to 90% of surges come from utility distribution systems, inductive loads, electromagnetic interference and radio frequency interference. More common is the high-power electrical equipment surge source, such as elevators, air conditioning and electric ice box. These high-power devices shutdown when the compressor and motor and other components requires a lot of power. This switching operation will produce a sudden and transient power demand seeking to disrupt the power system voltage stability. Although the surge is far better than flash power surges caused by strong, but their strength is enough to set up immediate or gradual deterioration equipment components, and they will most often occur in the building power system. Other sources include errors wiring surge, the power company's equipment problems and the old power cord and so forth. The current transfer from the generator to the home or office environment, transformers and line system is very complicated, which may have many points of failure and error will lead to current instability. In today's power distribution system, the occurrence of surge is inevitable. 1) Utility Distribution Systems interconnect many different types of loads that are continually switched, causing momentary short circuits and contact re-closures that can be hazardous for computers and other sensitive equipment down the line. 2) Inductive Loads are the result of powering up and down the electrical equipment with in a facility. They can send voltage fluctuations through power lines to other sensitive equipment on the line. 3) Electromagnetic Interference (EMI) and Radio Frequency Interference (RFI) are caused by the proliferation of electronic equipment in the work environment. They can be responsible for data errors and the early wear of electronic components.